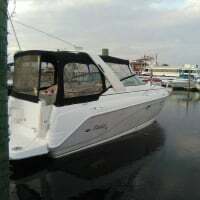 Rinker 242 with 350 Mag MPI. 2000 model. Engine was running decent but lacked power coming out of the hole. 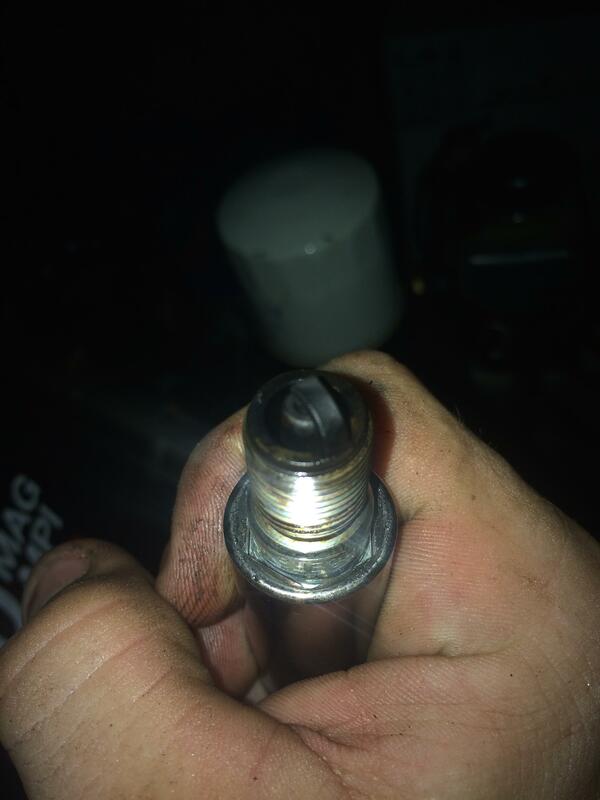 I decided to send the injectors off to be cleaned and flow tested, while removing the injectors i noticed one seemed to have a broken electrical connection on it and replaced it with a new one. All the other injectors came back good except one which was recommended to be replaced and i did replace it with a new one as well. While waiting for the injectors to be returned i decided to change the thermostat as a preventative maintenance type thing. After the change of the thermostat and reinstalling the injectors the engine started right up, actually faster than ever. (this is on muffs in the drive) It ran decent but i noticed some white smoke. After running it for a few minutes and checking everything out i turned it off and back on to make sure no issued and the engine was still seeming to smoke. My Wife said she had never seen it smoke before and we have run it on muffs in the drive quite a few times while working on things. I decided to rev the engine a little bit so i did so and she said she noticed black smoke coming out of the middle of the out drive props. I did not witness this first had as i was in the boat. I did notice however that the water when coming out of the exhaust and settling in the drive way had what appears to be ALOT of carbon in it. Then we shut it off again and it was hard to start without giving it some gas. I hooked my rinda diacom up and it is reading fine with no fault codes. 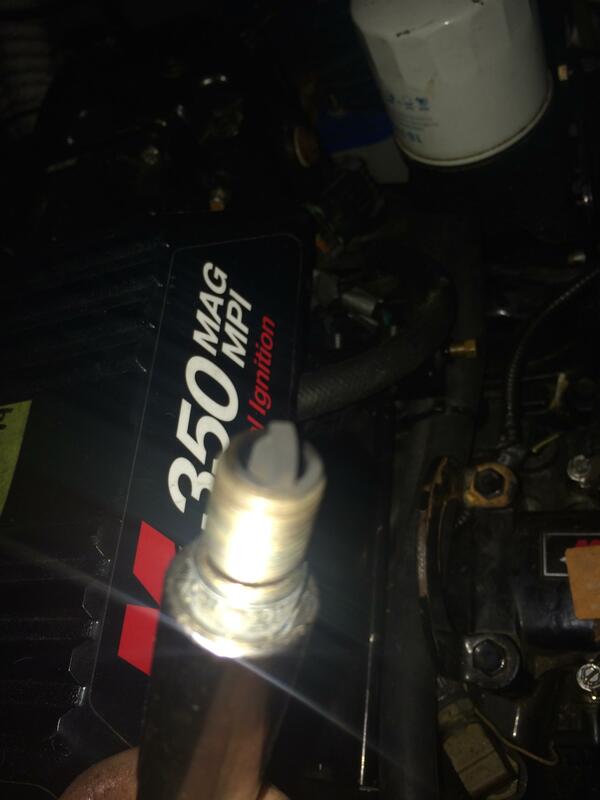 My only guess is maybe it is running on a cylinder that was not running on before due to a failed injector and it is causing it to burn off the carbon and such out of that cylinder but im no mechanic. Any help at all is SUPER appreciated! I want to get this straightened out before winter so it will be ready for early spring without having any problems. 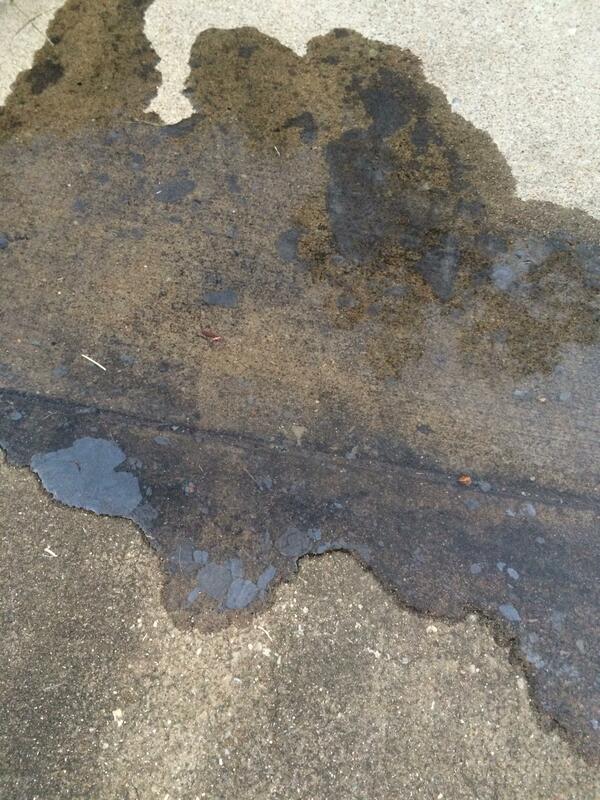 Here is a picture of the exhaust water. I pulled a three of the plugs real quick to get a read on them and it appears that two were dry and seemed a bit burnt and the other was wet. Not real good at reading plugs. These three were all pulled from the starboard side of the engine. The pictures are kind crappy. Have you checked the oil, is it normal color? Oil appears normal. Not burnt, normal color, consistency and level. @212rowboat has posted (several times) a chart of deposit colors on plug tips and what they mean. You should look for this as it will help you. I have always looked for a very light gray color as healthy combustion. I see some dark deposits on your plugs. Going from memory here, fluffy dark (black) means carbon deposits as in too rich a mixture - usually easy to correct. Hard black often means oil control ring issues - more challenging to correct. BUT before you go too far - questions - what was the temp of the thermostat you installed? what was your temperature gauge in the boat reading? You may need to test the thermostat. New Oem 160 therm. Gauge didn't read anything as I didn't run it long enough to get warm due to fear of something being wrong. I will try to find the post by row boat. Reading causes of dry carbon fouling, which is what appears on a few of the plugs. One cause is leaking fuel injector. The injectors are all new and freshly installed. Any one have an idea if possibly i didnt get them installed 100% and they are leaking out and causing the engine to run rich. When i turn the key on the fuel pump kicks on there is no visible leaking or sound of leaking. I guess i can hook my fuel pressure gauge to the rail this evening and see if there is any bleed off of pressure. you've done two things that can impact the engine's fuel trim- you've altered the thermostat which regulates engine temperature, and you've introduced new injectors which may flow better than the old ones. at start up the engine is running off of a hard scripted table... temperature, air mass, ect. aren't regarded until a certain threshold is encountered, and at what point it 'closes loop' by adjusting based off of sensors alone. It also 'opens loop' and runs off of hard scripts when you're at or near WOT. I don't know how Merc handles it, but most car pcm's start closing loop around the 125~140* mark. 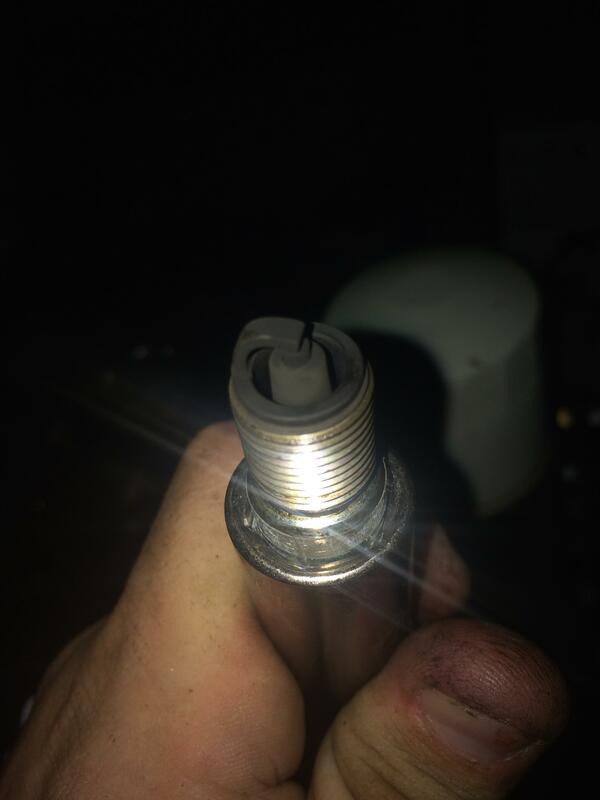 Injectors install is hard to screw up- either they seat or they don't, and if they don't it's usually pretty obvious with fuel squirting everywhere, so if you don't see that you're likely fine in that regard.. one thing about them is the connectors- ev1 or ev6, and they are delicate... I once chased a lean issue to one cylinder and simply couldn't figure it out until looking closely at one blade of an ev6, which wasn't making full contact and therefor had more resistance than it should have... that was a lean issue, not a rich.. one thing is certain is you're running rich... I'm just making a point that the connections are important. rich engines run smoother, and many wouldn't notice the excess fuel and think their cleaned injectors 'sure quitened down that engine', when in fact the ultrasonic process shook the fine mesh in the basket to the point it broke some of them, or even disrupted the pintle's seat and they're letting more fuel past than it's 'sposed to... For this reason, I pretty much don't condone injector cleaning... it's more a ruse than anything, but it can be done properly, too- it's just that most don't do it properly. I'll save the site some extra bandwidth by just suggesting you disconnect the battery, let the adaptive memory clear, and hope that is all you need to do- but I'm figuring instead you're going to have to address the injectors and/or fuel pressure before it's over with. great info 212 and nice to hear from you! RE: Taking battery cables off - Neg cable, Pos cable, or both? just for the record, I don't think this is it... I think he's flowing too much through those 'reconditioned' injectors. I'd say both, but if only one cable is removed, take off the positive, in case the PCM is accidentally grounded via the other battery (it shouldn't but if someone played around with the wiring it could be possible). "Boat + Water = Fun"
Sorry i have been MIA for a few days. I understand what you are saying regarding the PCM and i tried switching the battery selector to off for awhile to see if that would fix it but didnt. I did not unhook the battery cables yet because there are 4 batteries total (two on each bank) and thought maybe it would just relearn under driving conditions. We took the boat out last weekend and ran it for about 30 minutes hoping the computer would relearn and run at a better condition which it did run slightly better than before but it was still smoking some (the soot in the exhaust wasnt noticeable) but there was a significant lack of pour and did not run well. When i was finally able to get on plane, i would have to run full throttle to reach roughly 35mph and i normally am able to get around 45-50. Also at 3/4 throttle when i go to full throttle it falls on its face. I dropped the boat off at the shop immediately after that test so i guess i will just see what they say. Its scheduled to be looked at next Thursday (oct 1) I hope that they find something or they simply have the idea to just unplug the battery and that will fix it so it will save me some money, otherwise i feel like we are chasing ghosts. What i do notice that is uncommon is the loud vacuum suction noise coming form the IAC hole on the top of the engine. It usually makes some noise, but since the injector reinstall it is MUCH louder and can be heard at full throttle with the engine hatch on. Anyways, Ive rambled alot here but i appreciate the suggestions and if they cant figure something out ill start with the batteries and such and let you know how it goes or if they do get it ill report back with the solution. I have looked around and cannot find one. The noise is coming from the back of the throttle body where there is usually a piece of foam to quiet the IAC that quiets it. There very well may be a vacuum leak somewhere that i over looked, but i checked everywhere i knew to look and while i may have limited knowledge, but there are not too many vacuum hoses. Well got the boat back from the shop and they said it was only registering 18PSI on the fuel pump even though it was a brand new fuel pump. They changed it out with a new one thinking maybe the one i put on was a bad part. Took it out to the lake today and no luck. While its no longer running rich like before it still lacks the power it should have and it appears to have even less power than it did earlier in the season. With just me and my wife on the boat and 1/4 tank of gas it needs full tabs down and full throttle to get onto plane and when running it will only get to around 42MPH at 4900RPM when i have been able to get it up to 51 before at 5100RPM. Still have the loud vacuum noise from the back of the throttle body where the IAC is located. It is also occasionally dieing and not wanting to start back up unless i use the advance throttle. Im at a lost and getting broke. Any ideas? What about air? You can get rich from too much fuel, but also too little air. Do you have an obstruction (vacuum sound you are hearing)? None that I can see. Same sound when the flame arrestor is removed.